A bunion is a bony protrusion on the side of the metatarsophalangeal joint — the joint that connects the big toe to the foot. It causes the big toe to slant against the remaining toes, resulting in inflammation in the joint and leaving a prominent bulge on the side of the foot. The associated pain and swelling tend to worsen as the condition progresses. The exact cause of bunions is difficult to pinpoint, but they’re likely influenced in part by the shape of the foot, which can leave certain patients more likely to develop them. Many studies suggest that rheumatoid arthritis, as well as a family history of bunions, can increase a person’s likelihood of developing them. Ill-fitting footwear isn’t a direct cause of bunions, but it can exacerbate symptoms of the condition. Some patients with more severe or persistent bunions may benefit from a short outpatient surgery intended to restructure the joint. During the procedure, your surgeon will remove any growths on the joint and realign it as necessary to prevent the bunion from forming again in the future. Your surgeon may also insert a screw or plate to ensure that the bones heal properly. In the days after the procedure, you’ll need to place as little weight on the toe as possible, regularly elevate the foot to minimize swelling, and take any prescribed medications to manage pain and reduce the risk of infection. Your podiatrist will remove any sutures within two weeks of surgery, but you’ll need to continue wearing a brace and any dressings on the toe for another two to three months. As soon as the sutures have been removed, you’ll begin a physical therapy program designed to restore a complete range of motion to the toe and rebuild the surrounding muscles. Complete recovery should follow after three to four months of rest and rehabilitation. 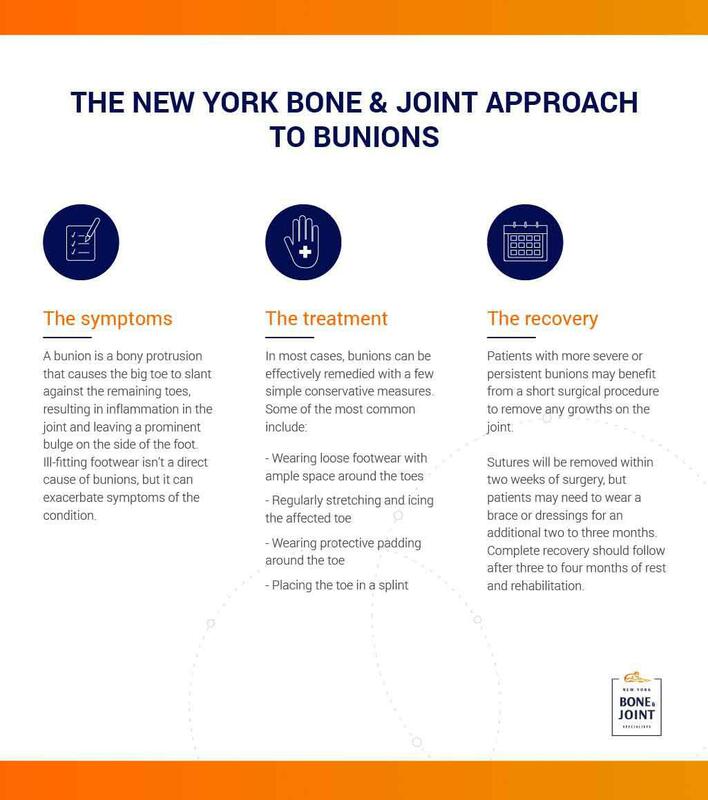 If you’re struggling with bunions, the team of specialists at New York Bone & Joint is here to help. With decades of combined experience in treating podiatric conditions, we have the knowledge and expertise needed to guide you to lasting relief. 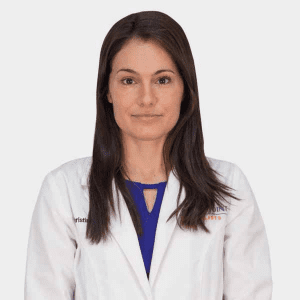 Schedule an appointment today to discuss your condition with an orthopedic specialist, receive a formal diagnosis, and explore your options for treatment.